Digha is very popular tourists spot and ideal place to spend weekends for the eastern part of the india. Digha beach is known as ‘Briton of the east’.The sea at digha is calm and beautiful.The sunrises and sunsets in digha beach will make you feel in dream. Digha beach is girdled with casuarina trees along the coast, which adds to the charms of Digha. Old digha beach is expanded to new digha beach(2km).The science centre and one of the largest marine aquarium are the latest attraction of new digha.Amaravati lake is the another attraction of new digha, you can enjoy boat riding there. There are so many tourist lodge and hotels are available near the beach. 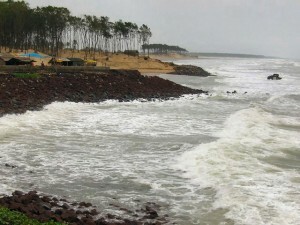 The distance between digha and kolkata is only 185km.It is only five-hour drive from Calcutta and is connected with Kolkata by good roads and trains. Best time to visit digha is september to march. Weather in winter 3-20°C and summer 23°C. Air: Nearest airport is kolkata 180 km from Digha. Rail: The cheapest way to reach Digha from Kolkata is to take the Duronto express from Howrah. Road: The convenient and fastest way to reach from Kolkata to Digha is to take a private car from Kolkata to Digha. Many route buses is also available from Mecheda,Kharagpur,Howrah & Kolkata. Shankarpur: Shankarpur, a unspoilt beach is located at 14km from digha.It offers nearly all the pleasures of a private beach. This beach too is girdled with casuarina plantations. A major project for development of Shankarpur as a high-class beach resort is in the pipeline.Shankerpur is famous for its fishing harbour project. Chandaneswar:This place is famous for shiva temple and only 6km far from digha.In the month of chaitra, thousands of pilgrims flock to the temple. This entry was posted in Digha, Seabeach, West Bengal. Bookmark the permalink.